Cuba - 2016-BK-23 CUBA 1$ 2016 JOSE MARTI UNC 4 CONSECUTIVE. PAYPAL PARA LOTES RELACIONADOS CON CUBA SE HA DESCONECTADO EL LINK DE DELCAMPE A PAYPAL PARA NO INCUMPLIR CON LA POLITICA DE USO DE ESTE SITIO WEB. LAS TRANSFERENCIAS BANCARIAS TIENEN QUE SER ENVIADAS EN EUROS. SI SE ENVIAN EN OTRA MONEDA LAS COMISIONES QUE SALGAN SERAN PAGADAS POR LOS COMPRADORES Y HASTA QUE NO SE TERMINE DE PAGAR EL SALDO ADEUDADO NO ENVIAREMOS LOS LOTES COMPRADOS. PAYPAL. LOTS TO RELATED TO CUBA has been disconnected DELCAMPE LINK TO PAYPAL FOR NOT BREAKING WITH POLICY TO USE THIS WEB SITE.BANK TRANSFERS SENT IN MUST BE EUROS. IF SENT IN ANOTHER CURRENCY WILL BE LEAVING THE FEES PAID FOR BUYERS AND TO NOT FINISHED pay the balance due PURCHASED WILL SEND the LOT. ACCEPT PAYPAL. EBAY-PAYPAL PROHIBIT THE SALE OF STAMPS AND COINS OF CUBA. FOR THAT REASON IF IT APPEARS THE WORD "CUBA" IN A BILL OF SALE PAYMENT DELCAMPE.COM not be processed. MAY WE ASK UNNECESSARY EXPLANATIONS avoid us. WILL HAVE TO GIVE ME YOUR PAYPAL ACCOUNT AND WE WILL MAKE A CLAIM WITH LOT NUMBER. YOU ONLY HAVE TO ACCEPT TO PROCESS PAYMENT AND THERE WILL BE NO PROBLEM. 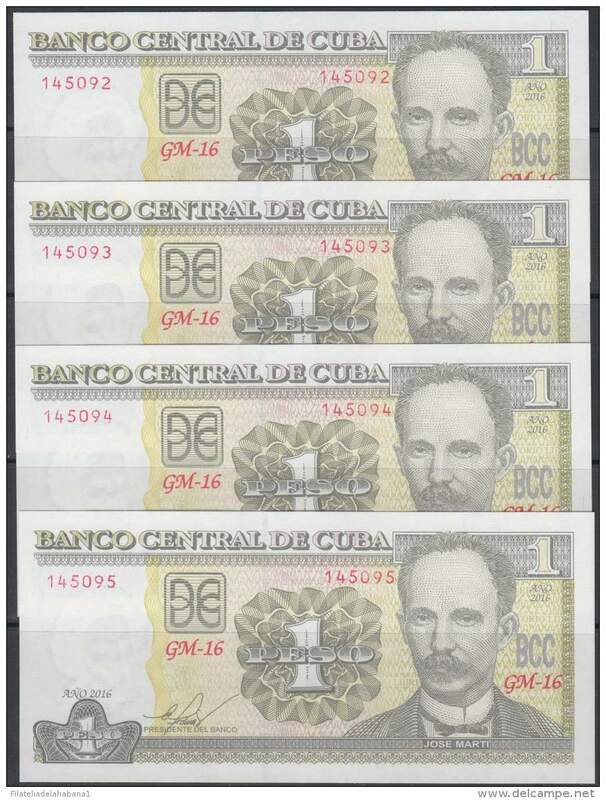 2016-BK-21 CUBA 5$ 2016 ANTONIO MACEO REEMPLAZO XF PLUS UNC EZ REPLACEMENT. 1956-BK-33 CUBA 1956 1 PESO JOSE MARTI. CONSECUTIVE UNC PAIR. 0000931-32-33. 2009-BK-115 CUBA 20$ 2009 CAMILO CIENFUEGOS. REPLACEMENT REEMPLAZO "CZ". USADO. 1943-BK-19 CUBA 5$ CERTIFICADO DE PLATA 1943. SILVER CERTIFICATE. SIGNED FULGENCIO BATISTA. 2007-BK-100 CUBA 2007. 1$ JOSE MARTI . UNC. 1985-BK-8 CUBA 1$ CURRENCY CERTIFICATE. CERTIFICADO DE DIVISAS B. UNC PLANCHA. 1985. 1958-BK-207 CUBA 5$ MAXIMO GOMEZ. CARGA AL MACHETE 1958 91a UNC. REPUBLICA DOMINICANA.